Hi everyone. 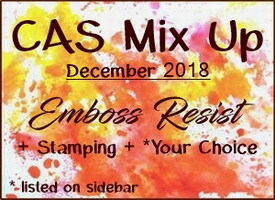 Welcome to the last challenge in 2018 for CAS Mix Up. This year has flown by, but it has been so much fun!! Thanks to everyone who played along with us this year. It's been awesome! I love this grid background stamp for the emboss resist technique. I embossed the grid in white and then sprinkled two colours of magicals over top (autumn crimson maple, ramblin' rose). The watery ink pools in the squares to create variations of colour. I added a white frame with silver stamped sentiment and beautiful die-cut flowers that were gifted to me by a sweet friend. Sequins add a little sparkle to finish the design. Check out the challenge blog to see the Emboss Resist CAS cards from our Designers, and special Guest Designer, BozenA (Art Card Box). Then come play along. We are also saying good-bye to Julia from the CAS Mix Up Team. Thank you Julia, for all your hard work and inspirational cards you've provided since being one of the first DT at CMU! Thankfully, Julia isn't going far!! She will be part of the newest CAS Challenge (see announcement below). I'm excited to announce the launch of a new challenge! I'm thrilled to have a very talented group of Designers joining me. Love the pooling of the colours from those beautiful magicals around the heat embossed grid. The crisp white die cut looks fabulous and so perfectly CAS. A unique and stunning card Loll x. Sorry to see Julia go (although not too far) and equally delighted to have Hideko on the team x.
Yay to the new challenge and I am so looking forward to being inspired by your amazing team x. Great colors on your background Loll - love the embossed grid and the added sparkle with your sequins - your die cut stems look lovely against it! Gorgeous heat embossed in white grid background, Loll. I love how the Magicals pooled in the tiny squared. Really cool effect. Beautiful with the added die cut flowers. TFS, dear friend. What a pretty Emboss Resist background with a pop of crisp white flowers, Loll! Love the colors of Magicals and the way the watery inks spread and pooled. The clear sequins are a sparkly and elegant finishing touch! Thank you so much for your hard work for the CAS challenges and inspiration this year. So looking forward to being on your team again next year. This one is just gorgeous, Loll! I may even have that grid and never used it so thanks for the idea. Love the beautiful colors, a welcome reminder of spring. Framed perfectly too! Wonderful grid pattern, flower and background! Gorgeous card, Loll!! That background is beautiful, Loll. It's so neat to see how the colors intermingle and pool together. Thanks for sharing this beauty of a card! What a beautiful background, Loll! The Magicals give it wonderful shimmer and a perfect resting spot for those white flowers! The grid stamp makes a great embossed resist. 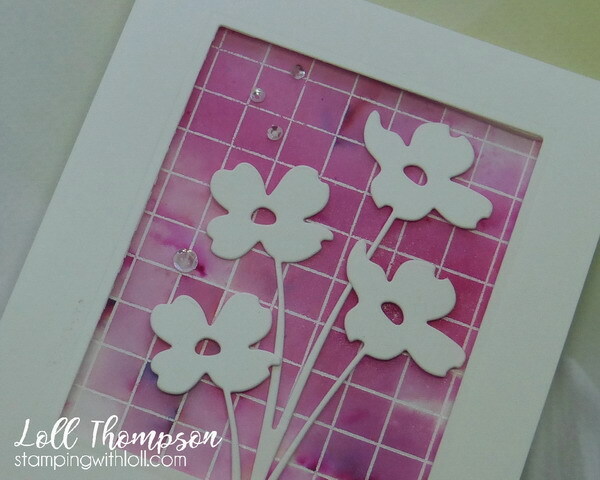 And your beautiful pink Magicals make a lovely background for the die cut flowers. Perfect placement of your sequins! What a gorgeous card Loll, the colours are so pretty and the grid in the background looks fab. This card design is very cool. I love that grid and such a fun way to use it. You are the best with silhouettes and this is another great one. The background color is so pretty. Ha, I have that grid background (in my NBUS box)! Love it as a background for your beautifully frame flowers! Such a delightful card, si crisp and clean. Love the vibrant background, perfect contrast for the white. Love your pretty background Loll with the sweet die cut and sequins. I thought of using my grid stamp for a card but I couldn't compete with this lovely creation, Loll. I do love the way the color pools in the corners and along the edges.